Persistence Market Research offers a comprehensive market study on fermented ingredients, capturing their expanse across all regions in the world. 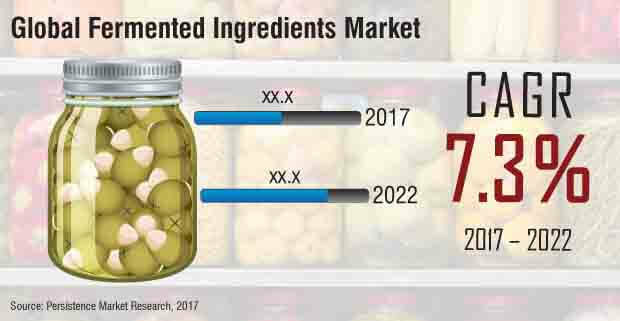 Titled “Fermented Ingredients Market: Global Industry Analysis 2012-2016 and Forecast 2017-2022,” the report has analyzed the global market for fermented ingredients by considering historical data as the primary point of reference for putting forth market size projections for the forecast period, 2017-2022. Revenues of market participants over the span of past five years have been aggregated to form the historical data. The report offers forecast on the global market for fermented ingredients across metrics such as Y-o-Y growth rates, revenue share ratios, absolute dollar opportunities, and CAGRs. The report comprises of multiple chapters and sections; each offering specific information associated to the future of global fermented ingredients market. In the executive summary, highlights from the report’s research findings have been compiled, which collectively offer a regional overview on expansion of the global fermented ingredients market throughout the forecast period. The report further provides an introduction to the overall fermented ingredients market, followed by a standard definition of – fermented ingredients. The report provides market size forecast and Y-o-Y growth rates in the subsequent section, which is supported with analysis of macroeconomic factors. In the report, the global market for fermented ingredients is also analyzed on the basis of supply chain breakdown, raw material sourcing strategies, pricing & cost structure, and market participant presence across all regions. In the initial chapters, key segments of the fermented ingredients market are revealed through the market taxonomy table. Regional, product-type, application, process, and form are the primary segments upon which the market has been analyzed. Sub-categories of these segments are summarized in the table below. The report also provides in-depth forecast across these sub-segments. The report includes a slew of sections delivering segmented forecast on the global fermented ingredients market across all parameters. Cross-sectional data and country-specific forecast on fermented ingredients market is also offered in these sections. The report concludes with a detailed profiling of key market participants. This section reveals the competitive landscape of global fermented ingredients market, providing information of their latest developments and current market standings. Persistence Market Research has employed strong research methodology underpinned with extensive analysis on trends impacting the growth of global market for fermented ingredients. Market size estimations offered in the report are analyzed through primary responses, public domain databases, and historical data. The scope of this report is to offer a wide-ranging analysis on the global market for fermented ingredients, and provide a forecast on future demands for fermented food products. Companies in the fermented ingredients market can devise long-term business strategies by inferring to the research findings availed in this report. The report projects that by the end of 2022, the global sales of fermented ingredients will rake close to US$ 40 Bn revenues, reflecting robust growth throughout the forecast period, 2017-2022. Increasing awareness on health benefits associated with consumption of fermented ingredients is expected to fuel the growth of the overall market. Owing to their role in easy preservation of food items and affordable procurement, manufacturers of food & beverage products are also showcasing a considerable uptake in adoption of fermented ingredients for production processes. The global market for fermented ingredients includes a wide range of products, among which amino acids and organic acids are slated to reap high revenues. In 2017, the collective revenues share of amino acids and organic acids in the global market is pegged to be over 45%. High demand for amino acids as fermenting ingredients is factored by their role in boosting fermentation process. The report also expects a surge in demand for polymer fermented ingredients, revenues from which are anticipated to exhibit robust CAGR during the forecast period. Vitamins are also expected to gain grounds as key fermented ingredients in the food & beverage sector, with their use increasing in the production of probiotic drinks such as Kefir. Fermentation of pharmaceutical ingredients is gaining traction in the global healthcare sector. Fermented ingredients are being used for breaking down compounds under aerobic or anaerobic conditions, facilitating the conversion of a substrate to pharmaceutical products. In 2017, over one-fourth share of global fermented ingredient revenues will be accounted by their application in pharmaceuticals manufacturing. The report also projects that food & beverage production will be the largest application of fermented ingredients, revenues from which are expected to surpass US$ 12.5 Bn by the end of 2022. Fermentation processes involve chemical breakdown of substances, wherein considerable amount of heat and effervescence is released. End-users of fermented ingredients are being inclined towards batch fermentation process to lower the incidence of undue reactions during chemical breakdowns. Fermentation of substances done in separate batches ensures better quality of end-product, and also follows the manufacturing standards of regular sterilization of fermenters. Through 2022, batch fermentation as a process will contribute to more than US$ 16 Bn in revenues. On the contrary, the demand for continuous fermentation process will be relatively less, and contribute to less than one-third share on global revenues during the forecast period. Companies manufacturing fermented ingredients are focusing on product launches and extensive R&D work. Leading foodmarker, Cargill Inc., recently opened an aquaculture research lab for development of new diets through fermentation of fishes. Along with Cargill, the report has profiled other key players in the global market for fermented ingredients, which include AngelYeast Co., Ltd., Associated British Foods Plc., BASF SE., Döhler Group SE, E.I. duPont de Nemours and Co., Frutarom Industries Ltd., Ingredion Incorporated, Kerry Group Plc., Lallemand Inc., and Lonza Group AG.